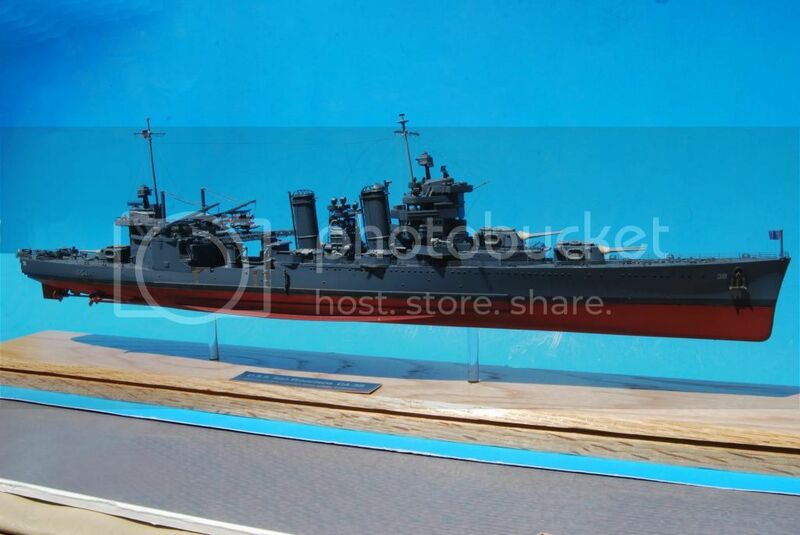 Question regarding metal ship display pedestals. I seem to be asking a great many questions on this forum recently, hopefully I'll eventually be able to return the favor once I've got this all figured out... Until then I'll have to avail myself of your collective knowledge. My thanks in advance. I'm having a surprisingly difficult time finding suppliers of metal - brass, nickel, etc - ship display pedestals. Found a few on ebay and a number of slotted wooden sailing ship types. I'm hoping for a greater selection and maybe one of you can point me in that direction. So far this is the best I've found. Brass is traditional, and I appreciate that, but I think I'd prefer nickel, or chrome. I, and many others have used brass lamp finials, available in electrical section of hardware stores. You do have to drill the hole through the top of each one, though, to use as ship mounting. Lately I have been using clear acrylic (plexiglas) rods, as in this cruiser I recently finished. For plastic ships I glue in a piece of wood before drilling the holes to reinforce the mounting of the rods. As soon as I do that, I match drill a scrap piece of wood, which is then used as a pattern for drilling the final display base. Actually, I recommend doing this when using finials too, though that is not quite as critical as when using the plastic rod. Like Don I use different materials . Now usually what I do is use three on modern vessels with semi , to flat bottoms . I go to Home Depot and get lamp finials from the brass or brass colored ones . The idea of two is fine for a Destroyer , Cruiser or Battleship . I use three on Carriers for stability . The lexan or cast Acrylic in a twisted square form makes a very interesting mount .The nice part about this material is you can drill it then cut threads in it on both ends .To mount to the base then to the ship . Large flat washers bent to the ship's bottom shape and Light duty lock washers and there you have it . Both methods are good . I find for a formal ( Muesum ) grade , that venue preffers Brass . T.B. Ship modelers often need to consider their final presentation/mounting method before they close up the hull. Epoxying nuts into the hull, brass sleeves, or threaded inserts are items which are often used. You express an interest in a material finish other than brass. The lamp finials which Tank recommends are most often seen in bright or antique brass. Nickel or chrome are not as common. By all means check the hardware store for them. Try the small parts cabinet in the hardware aisle - there are some plain standoffs. Better yet, look at the chrome doodads available at the auto supply store -- try valve stems or valve caps for a shorter effect. Having a drill press is a nice to have. Mount the part into the drill press vice. Use padded jaws or secure in a location which will be cut from the finished part. Make sure that tyou are plumb and square to the drill bit. Drill a through hole for the mounting hardware (pilot drill then finish size). Cut parts as needed. Thread the bolt through the base and pedestal, then attach to the bottom side of the ship. Hint -- make a temporary work base out of pine or plywood. this allows the model to be positioned without touching/handling the model. The aluminum and the stainless steel tubing sold in hobby shops will work as pedestals. The aluminum is more of a matt finish, the stainless is very shiny, almost like chrome. The aluminum you speak of can be buffed . Using #0000 Steel wool , shine it till it gleams , Cut to size , mount , then clearcoat to preserve the shine . T.B. Yep, but the stainless is shiny already- saves polishing- and will hold that shine forever. Yeah , so true . I have tried , probably most stuff at times . You know what was a real outstanding base for one client's model ? I used a Wheel spoke handle from an old style ships wheel .Turned it on it's side and cut a small groove for the ship's keel . At least I found a good use for the last one on the wheel ! . Another I've tried , at the urging of a wood-carving friend was a pair of small Walnut Burls . Came out stunning . Gosh , how I wish had kept those photos . I have found you can use most anything that is strong enough to support your ship . A client once wanted Revell's Speed/Racing/Ski Boat displayed on a Bicycle model . Weird right ? Didn't look bad after I had him find smaller ones and we did a two bike cradle . He was big time into Ironman stuff . Came out unique but nice . T.B.